Sold his first professional works to the Flag of Our Union magazine of Boston? Changed publishers; and then wrote thousands of stories, many of them in serial form, for what was one of the country’s most widely circulated magazine of the day? Filled his “fiction” with thinly disguised characters modeled after friends and acquaintances here in Norway? Wrote under numerous pseudonyms, to enable his publishers to get as much mileage as possible out of his talent? Spent a good deal of time traveling, and mined salable fiction out of every place he visited? Was the grandson of one of Norway’s earliest settlers; First lived on a family farm in the outskirts of the town, but later purchased a more commodious home several miles closer to the railroad station? Was rumored to be conducting unusual medical experiments here in Norway? Wrote of at least one curious encounter with Hannibal Hamlin? And whose widow, shortly after his death, set about to publish many of his better-known stories in book form in order to keep his literary accomplishments in the public’s eye? Or maybe the challenge could be put more simply: Name the local writer who was the most famous in his own day. However, before I reveal the answer to this question, I need to point out that Norway has been particularly blessed with writers of talent and success. Although not all of these people were born in Norway, they have all resided here at one time or another in their lives, and each of them would admit—I am sure—to having at least a little bit of Norway in their blood. These writers would include (in order, perhaps, of the briefness of their stay with us) Talbot Munday, a best-seller of the early part of the last century, best known for his 1917 novel King–of the Kyhber Rifles, which was serialized nationally and turned into a popular movie. Much earlier, in the 1840’s, a young man of Waterford moved with his brother to Norway, where he attended school and worked as a printer’s devil for the Advertiser. His name was Charles Farrar Brown. He later added an “e” to his surname and then took on the pseudonym Artemas Ward, under which he became one of the most famous public performers ever to have been born in Maine. His books, which were adaptations of his wildly popular “lectures,” did very well, indeed; and had his life not been cut so short by the exhausting toll of his popularity, it might well be he who would be the subject of this talk tonight. Finally, during a good part of the twentieth century, Norway’s cultural scene was graced with both Don Seitz and Hugh Pendexter. Seitz’s biographies of Horace Greeley, Joseph Pulizer, Abraham Lincoln and the above-named Artemas Ward were important additions to our national experience; and Pendexter’s many historical novels were both entertaining and substantively instructive. Indeed, if my question had only to do with quality of writing and intellectual value of the works produced, either one or the other of these two writers would undoubtedly win the prize. As mentioned earlier, however, my question this evening concerns number of readers and sheer quantity of prose being sold, and under these criteria the only local writer who was ever able to out-C.A. Stephens C.A. Stephens was… Sylvanus Cobb, Jr.
It’s true that you won’t find a volume by Sylvanus Cobb, Jr., on too many library shelves these days; and I can assure you that he would not make the “top hundred,” or perhaps even the “top ten thousand,” list of any serious literary critic. But in terms of sheer verbal output, readership and national notoriety in his own day, Sylvanus Cobb, Jr. is probably surpassed by only a single Maine writer: Stephen King. However, the primary reason I’m discussing Cobb here this evening, is not only to help resurrect his local image, but also to suggest the role he may have played in the career of the Norwegian who followed him as the local “famous son,” Charles Asbury Stephens. Sylvanus Cobb, Jr., was certainly a famous man in his day, and he was the son of an almost equally famous man. In fact, that’s why he retained the “Jr.” at the end of his name even long after his father had died. He not only wanted to distinguish himself from his father, but he beleived his father’s writings would be in print much longer than his own, so he just didn’t want to confuse the public about who was who. The father of Sylvanus Cobb, Jr. was the child of pioneers who had trekked by ox-cart from Carver, Massachusetts, into the woods of Norway in 1797. Perhaps the Cobbs were “late-comers” by local standards, since Stephens’s great-grandparents had already been in Norway eleven years at the time the Cobbs arrived in their cart. But both families were equally hearty, and they energetically peopled the community with their offspring. The Cobbs had three sons, two of whom would live, prosper and die as respected citizens of the town. The third, however, Sylvanus, Sr., would eventually enter the ministry—that most transient of occupations— and would live first in Waterville, where his first son, Sylvanus, Jr., was born in 1823, and later in Malden, Massachusetts. The Sylvanus Cobb who would eventually become “Senior” was born the year after his parents came to Norway, and he distinguished himself very early as a personality to be reckoned with in town. As early as age fourteen, he began writing political pieces in support of the War of 1812. Shortly thereafter he joined Norway’s Universalist congregation, which was one of the earliest of that then controversial theology in New England. After studying in New Hampshire with Rev. Sebastian Streeter, one of the founders of Universalism, Cobb, Sr., was ordained in Winthrop in 1821. While proselytizing from the pulpit, he also ran for and was elected to the legislatures of each state in which he lived. Upon moving with his family to Malden, Rev. Cobb established a newspaper, The Christian Freeman and Family Visitor, which preached Universalism and trumpeted the even more radical political tenets of total abstinence and abolition of slavery. He was large in stature and relentless in debate. He was a truly formidable man. And his biography was written by one of the most well known writers of the day—his son, Sylvanus Cobb, Jr. The writer’s mother, Eunice Hale Waite, was also a person of stature. She was one of the founding members and a long-time officer of the Ladies’ Physiological Institute — said to be the first women’s club in America. The controversial organization was devoted to the study of the human body, personal and public health, and the general social welfare. Eunice Hale Waite Cobb was a frequent writer and a forceful public speaker — certainly one of the most notable women of her day. Although the junior Sylvanus Cobb spent his schoolboy days in Malden, Massachusetts, he spent many summers on his uncle’s farm in Norway. At the age of 17, Cobb went to New York City, where he enlisted in the U.S. Navy. He spent much of the next three years in the various ports of Europe and the Mediterranean, where he visited, journaled and wrote home about all of the major sites and cities. As a result of his obvious writing abilities, he was made clerk to the commanding officer of his ship. After three years in the service, he returned to Malden, where his father put him in charge of the family’s publishing business. The following year, in 1845, at the age of 22, he married Mary Jane Mead, who had been a fellow student earlier at Waltham High School. 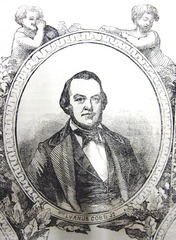 In 1846, Cobb left his father’s printing business and, with his brother as partner, began a publication of his own – the Raccabite – devoted to “temperance, moral elevation, literature and general intelligence.” Although much of the magazine’s material was editorial in nature, Cobb soon began using short stories to illustrate the evils of alcohol. These were his first pieces of published fiction. As the volume of his writing increased, he began looking for other commercial outlets; and in 1850, he was commissioned by Frederick Gleason to write a serial story for the popular family magazine, Flag of Our Union. The work, entitled “The Prophet of the Bohmer Wald: A Tale of the Time of Joseph II, Emperor of Germany,” was very well received; and Cobb soon became a regular writer for the magazine. In fact, Cobb’s rather exotic subjects and dramatic writing style served the publisher so well that he soon began running Cobb’s tales in a second magazine, the Pictorial Drawing-Room Companion. Gleason could not get enough of Cobb’s writing. At the publisher’s suggestion, in 1851, Cobb began submitting two serial stories simulataneously, one under his own name and another by “Austin C. Burdick.” And “Burdick” soon became as popular with the magazines’ readers as Cobb. Cobb’s gregariousness led him to several friendships in Norway which endured throughout his lifetime. In particular, he spent much time with George Beal, proprietor of the local hotel, as well as with Oscar Noyes, William Wirt Virgin and Harry Rust. The group would meet regularly in Judge Virgin’s office to smoke, play cards and discuss the events of the day. Another close friend was the local photographer, Anthony B. Crockett. Cobb’s daughter later reported that her father often frequented Crockett’s studio, where he collected old photos and tintypes of local citizens, which he used as inspiration for characters in his stories. It was also a poorly kept secret in town that Cobb, under the tutelage of a local doctor, obtained a cadaver and dissected it, supposedly to help him write more accurate physiological descriptions. 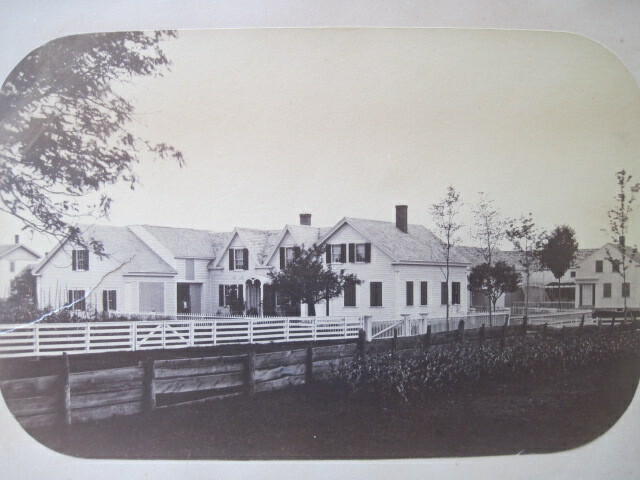 After leaving Yagger, Cobb’s home in Norway village was at the corner of Danforth and Temple Streets. This house was torn down in recent years. Then, when offered a lucrative contract by Robert Bonner, publisher of the New York Ledger, Cobb relocated to Newark, New Jersey; but after a year and a half, in 1857, he tired of city life and returned to Norway, where he again took up residence in the village. The family remained in town another decade, before they made their final move — to a grand new home in the Hyde Park section of Boston. Cobb spent the remaining twenty years of his life at Hyde Park. Finally weakened by declining health and recurring bouts of pneumonia, Cobb died at Hyde Park on July 20, 1887. He was a relatively young sixty-four years old at the time. Sylvanus Cobb, Jr., was certainly a well-known man when he moved to Norway in 1852; but by the time he left in 1867, he was truly famous. Initially, he sold his work to numerous publications, but his primary outlets were the family magazines published by Frederick Gleason in Boston. But Flag of our Union and the Pictorial Drawing-Room Companion, were also read nationally, and one of their readers was a competitor, Robert Bonner of New York. Bonner very much liked the style of Sylvanus Cobb, Jr., but when he spoke to his wife about trying to hire the writer, she declared that if one of Gleason’s writers were to be recruited, it should be Austin C. Burdick, whom she thought was a better writer than Cobb. In February, 1856, Bonner wrote to Cobb, urging him to submit a serial story for review and offering him double whatever the rate he might obtain for it elsewhere. Cobb immediately sat down to his writing desk at the farm in Yagger and dashed off a tale entitled, “The Gun-Maker of Moscow, or Vladimir the Monk,” which Bonner accepted and published in nineteen episodes beginning in March, 1856, just one month after he had sent his initial proposal to the writer. The piece was a huge success. Bonner later credited it with vastly increasing the circuclation of the Ledger. Indeed, “The Gun-Maker of Moscow” was a gift to Bonner that kept on giving. The Ledger republished it in 1859, and again in 1880. It went through numerous printings as a separate volume; it was presented as a play in New York; and as late at 1913, it was made into a silent film. The story was very much like other tales written by Cobb, both before and after. It took place in an exotic location, involved simply drawn characters, twisting plots, passionate encounters and ended with a wedding. In fact, Cobb never considered it to be his best work; but he acknowledged that, for whatever reason, it was far and away his best known. The gun-maker is young Ruric Nevel, who confesses to his mother that he’s hopelessly in love with the exquisite Rosalind Valdai, the orphan of a noble family. Rosalind is under the guardianship — nay, the virtual imprisonment — of the evil Duke of Tula. On one brutal winter Moscovian night, there is a rap at the gun-maker’s door. It is a poor and hungry monk. Ruric and his mother welcome the man warmly and offer him whatever their humble home can provide. The grateful cleric leaves the next day vowing somehow to repay the family’s kindness if ever he can. In the meantime, the foul Duke is engaged in a dozen dark plots to overthrow the new Czar, Peter, and — even more heinously — he’s determined to force Rosalind to marry him the minute she reaches her majority — which date is just a week or so away. Through nineteen suspenseful episodes, bearing titles such as “A Startling Trial,” “Strange and Complicated,” and “Thwarted, but not Subdued,” Cobb guides the reader to the the inevitable show-down. As the Duke forces Rosalind to her knees and orders his sycophantic priest to intone the blessings, Ruric leaps into the hall crying, “Hold!” The Duke instantly summons a small legion of goons to attack the intruder, but as they draw their weapons, the ominous figure of a glowering monk bursts upon the scene. “Hold!” he commands. The duke’s minions are frozen with apprehension. The duke, himself, is in a frenzy. Rosalind leaps into the arms of Ruric, as the monk removes his cowl, revealing himself to be none other than… Peter, the Czar!!!!! The duke is arrested and stripped of his title. Ruric is dubbed the new Duke of Tula and Rosalind fairly faints with joy. Those who are compelled may read the entire story here. So Sylvanus Cobb, Jr., was indeed a popular American writer. This is indisputable. And Charles Asbury Stephens almost immediately followed Cobb from Norway to success as a popular writer. Certainly the two must have had some personal or professional connection. Or did they? Unfortunatley, the relationship between Sylvanus Cobb, Jr., Norway’s first “big” writer, and Charles Asbury Stephens, the town’s second writer of note, is difficult to pin down. Between 1852 and 1867, when Cobb was undoubtedly the town’s most prominent personality, C.A. Stephens was between the ages of eight and twenty-three. Stephens would have attended the school for which Cobb was a committeeman. 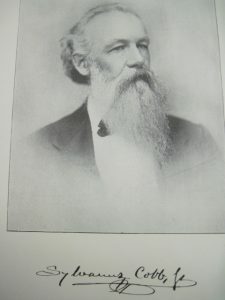 Stephens would undoubtedly have attended Cobb’s lectures at the lyceum. Stephens certainly would have read many of Cobb’s stories in the popular magazines of the day. Stephens would have been clearly aware of the presence of this famous man in town, and he might even have been inspired by the fact that his town’s wealthiest citizen was — a writer. It’s certainly easy to imagine a scene such as this: Stephens at the age of 21, in 1867, is preparing to head off to Bowdoin. One day he comes into the village; and as he passes by General Beal’s hotel, down the steps comes Cobb. Maybe no photo exists of Sylvanus Cobb, Jr., shaking hands with Charles Asbury Stephens, but Stephens was nothing if not observant. The social, professional and political space which Sylvanus Cobb, Jr., occupied in Norway during the coming of age of C.A. Stephens had to have been immense. And the craft which Stephens plied, as well as the manner in which he plied it, is so similar to that of his famous predecessor that even the casual observer must recongize a connection between the two. The real curiosity to me today is that C.A. Stephens — whose output was less, whose audience was more limited and whose contemporary notoriety was considerably slimmer than that of Sylvanus Cobb, Jr. — is better known in Norway today than is his predecessor. Maybe this is simply because Stephens is the more recent figure. Or maybe it’s because stories of the old home farm are more readable today, or more “local,” than are tales of dukes and monks in Russia. Whatever the current situation and whatever its cause, the fact is that Norway was home to two remarkable writers who shared fascinating similarities and exhibited unique differences. They helped immeasurably to create our local culture, and they brought us together here tonight. Note: For a very detailed account of the author’s life, see Ella Waite Cobb, A Memoir of Sylvanus Cobb, Jr., Boston, 1891. There is a copy at the Norway Memorial Library. It may also be read on-line (as of August, 2011) here. “Oh! A farmer’s life is the life for me!” I cried, as, wearied and heartsick, I turned away from the great Babel, and made my way into the country, where I had been offered my choice among several very good farms. The fact was, I had been shut up in the city long enough, and as I looked forward to the country, I saw it through the mediumistic glasses I had worn when a boy, or during pleasant summer visits to the New Hampshire mountains, and the grand lakes and forests of Maine. There was poetry in it, I knew, but I felt sure there was also a substratum of practical and economic common-sense. Enough to say that I sold my house in the city, and posted off with my little family for the country, with bright visions of the restful, grateful life before me. Of course, a farm must be taken care of and worked, and, as in other industrial departments, there are chances to be taken in advance, which may turn out either fortunate or unfortunate. But the grand central thought— the thought swaying and giving direction to all other thoughts—was, that the farm would perform a vast amount of its own labor; that, in owning a farm, I was bending Nature to my free service. I must prepare the soil and plant the seed, and then, whether I waked or slept, Nature would work for me—work on, on, on, never ceasing, until she had brought forth the blade, and the ear, and then the full corn in the ear. Ay,—and then the jubilant sport of recreation which would come in very often: the pickerel and the perch of the ponds, the trout of the swift-running brooks; the pigeons, the partridges, and the rabbits of the limitless circumjacent forests. Not only sport of the most exhilarating kind it would be, but every fish drawn forth to my basket, and every item of game to my pouch, would be a gain to my larder,—an addition to the store and stock of necessary provisions. My Uncle Sam was on the ground,—he owned a large farm in the neighborhood where I proposed to settle. In fact, his presence there had solely decided the matter of location. Dear, good old man! He has gone over the shadowy border now, but his pictured face hangs near me as I write, and the genial, kindly features, almost speaking as in life, smile down upon me as in the other times. He was a good man, and if he had his faults they were on the side of humanity, and came from a heart rather too full than a heart contracted. He was anxious that I should become his neighbor; and while I was seeing my house go up on the land I had bought, he gave me a home beneath his own roof. One evening Uncle Sam and I sat down with paper and pencils,—paper unspotted and pencils sharp,—and, under his lead, we did a year’s farming on paper. We ploughed, and harrowed, and spread manure, and planted; and we cut and got in hay, and cared for the stock, and garnered the harvest, and fattened the hogs and mutton and the beef; and then we got up the winter’s wood, and enjoyed the long and grateful rest. I remember particularly how we figured out the result of the corn crop. The value of the rich dressing was not to be counted in, because that had come from hay eaten upon the place, and worked into growth of cattle, horses, and sheep; and, moreover, it was to make the soil productive of more hay in the succeeding years. The labor of plouging, and planting, and hoeing, and harvesting, we estimated, and the value of the fodder from the stocks would cover a great part of that. At all events, when we had filled up the paper with memoranda and figures, we had, from an acre and a half of land, two hundred bushels of ears of sound corn, equal to one hundred bushels of shelled corn. The result was grand! Why, my farm was to return me a support for myself and family, and I could hire the rough labor all done at that! Butter, cheese, eggs, milk, corn, flour, flesh, fish, and fowl, and pork—all, all the return of my good farm. The first cost of land and buildings and stock had been all paid. Ah, a farmer’s life is the life for me! And I went into it. I was a gentleman farmer. I found time away from my desk, with my Uncle Sam’s assistance, to give direction to my workmen; and be sure I found plenty of skilled farm labor in return for money. I saw large, good farms which had been taken up and started by stalwart, healthy, frugal, hard-working man and wife in the morning of their lives—farms on which they had labored without ceasing, early and late—where their children had been born and nurtured, and on which they had been reared to labor and toil—farms on which the founders had grown old and decrepit; and, in a majority of cases, stern necessity had put a mortgage on the farm, the interest upon which was as a canker, sore and thankless. And in the end a younger son takes the farm, with the mortgage upon it, and gives a bond for the support of his aged parents while they live. That was the picture—the stern fact—as I saw it on every hand. Then how could I wonder at the result of my own venture? By and by, at the end of two or three years, I took another piece of virgin paper, with sharpened pencil, and sat down to another computation. That other computation wherein my Uncle Sam took the lead had been upon the possibilities (possibilities, my uncle had called them) of the time to come; this present was from the stern, unadulterated facts, as they stared me in the face from the pages of my faithfully kept journal, wherein I had made an entry of every penny expended, outside and in—on the farm and off—and of every penny of income, giving the proceeds of the farm their market value, and keeping a strict minute of every item bartered or sold. Well—I remember very well the first item which I showed to my wife. She had been the butter-maker, and be sure our butter had been good—what there was of it; but when I remembered that we had used pure rich cream—all of us—for sauce and for gravy—using it as freely as we did the milk itself, it was apparent why we had been obliged to buy most of our butter. The butter bought, generally by the tub, of our best dairy-keeping neighbors, has cost me from seventeen to twenty-five cents per pound. Every pound which had been made in our own churn, making every allowance for a fair value to us of the cream otherwise used, had cost, as near as I could reckon, two dollars and thirty-seven cents per pound! And I can only say that everything else cost very nearly at the same proportion. I did not eat a potato from my bin of hundreds of bushels that had not cost me almost at the rate of imported fruit! My wife and I sat down and went over the recknoning, and then adjourned to the pantry, and brought forth a brimming mug of new cider, and pan of doughnuts, and a new, rich cheese, from our own milk-tub press. It was a feast, not so sumptuous as some grand monarchs have set before their guest, but I had the satisfaction of knowing that it was costly—very much like the feast of Cleopatra, when she drank a dissolved pearl of great price to the health of Antony. And over that feast in our pantry, lord and lady of the manor, we resolved to relinquish the sceptre—to sell out. And even here—to the very end—the shadow of inexorable fact settled down upon us. When I came to sell, I found a farm to be simply and nothing more nor less than a farm. If the land was properly cleared and fenced, with a comfortable dwelling and barn and sheds, that was a farm, and the grade of price would vary accordingly as the farm was large or small, rich of soil or poor, or as it might be furnished with valuable fruit-bearing trees. The chief value to me—or, at any rate, the chief cost—had been my buildings. I had laid out more money upon the cellar under my barn, with its walls of cleanly-split granite, some of the stones of which were twenty feet long, and as straight and true as a stick of hewn timber,—I had put more money into that cellar and its furnishings than would have built every stick and joint of space of every building on a farm close by that sold, a year later, for one-third more than mine did! I found that the professional, or “gentleman,” farmers were not looking that way for farms. If I sold at all, I must sell to a man who was going to dig his subsistence from the soil—every grain and every penny of it. He did not want a fine house; he knew nothing about the value of such a barn cellar. All he wanted was room enough under cover, properly secured against the cold and the rain. I sold my farm; I came out from the grand experiment; and, if I may venture to tell a bit of a story “out of school,” you can judge how I came out when I tell you that at the very last, as I was preparing to depart from that section of the country for a new home, the tail of the agricultural “elephant” which I had not yet been able to lift from my weary shoulders, was kindly and with a genial bit of pleasantry swept out of the way by the publisher of the New York Ledger. Sylvanus Cobb, Jr. (1823-1887) was born in Waterville, Maine, where his father, a noted Universalist minister, was stationed at the time. Many of the writer’s fondest boyhood days were spent visiting his uncles in Norway, Maine; and when Cobb attained a degree of financial stability he relocated to that town, where he lived from 1855 to 1867. “Uncle Sam” was Samuel Cobb (1802-1875), whose large farmhouse still stands on the east side of the Yagger Road in Norway, Maine. Just beyond it on the same side of the road is the smaller house, described here by the author. Excerpted from Ella Waite Cobb’s Memoir of Sylvanus Cobb, Jr. (1891).